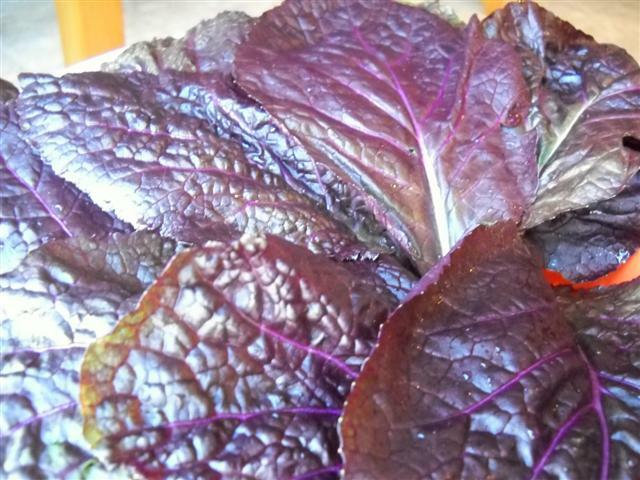 I was lucky enough to get my hands on some purple mustard greens at the farmer market (this was a couple weeks ago, but Im just getting around to posting now!). The color was so gorgeous and intense that I wanted something that would showcase its flavor, but I couldn’t decide what to do with it. I had gotten a cookbook from the library “Purba: Feasts from the East” by Laxmi Parida. It is filled with delicious Oriya recipes. One of the recipes is called poi saga rai. Poi saga is a type of green pictured here, but I am substituting for the mustard greens. 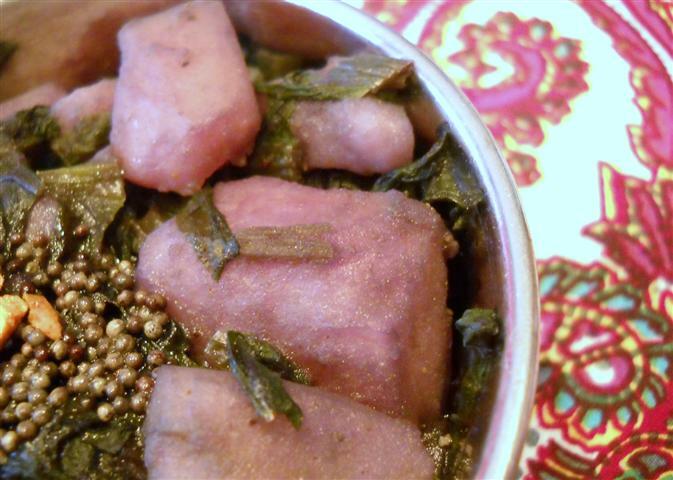 Rai is described as a “moderately spicy and slightly moist entree”. I worried that it may be a bit bitter as mustard greens sometimes are, but it wasn’t at all. It was quite mellow and this was a very tasty dish. 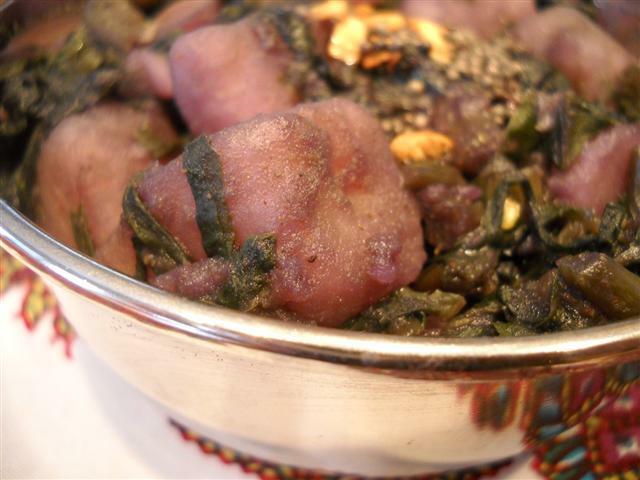 Unfortunately they did not retain their purple color after cooking, however, the color did transfer to the potatoes! For the masala, crush together ginger and garlic and mustard and then mix in the other ingredients to form a paste using little water if necessary. Separate the stems from the leaves and finely chop the stems. Roughly chop the leaves. Peel and dice the potato and put into a pan with enough water to just cover them. Add the stems and the sorisa masala and salt. Bring to a boil. When the potatoes are almost cooked, add in the green leaves. If there is excess water in the pan, turn up the heat to evaporate it. Heat a small bit of oil or ghee and add in the crushed garlic and the mustard seeds until they pop. Pour this seasoning/baghar slowly over the potatoes/greens. Garnish with grated coconut(optional). And Only Greens by Sara and Pari.